Every now and again I see something so simply stunning that it leaves me speechless. OK, I’m kidding; I’m never speechless. But this really is flipping amazing. Tell me: which of these two pictures below is a Hubble Space Telescope image of the nebula Sharpless 2-106, a massive young star blasting out jets of gas, and which is a painting by my delightful space artist friend Lucy West? You might be forgiven if it’s not easy to tell. Of course, the one on the bottom has Lucy’s signature on it, making this task somewhat easier. But seriously, if I showed you just the art itself, you’d have a hard time telling which is which. FYI, it’s acrylic on canvas, and is 30" by 48". Lucy is seriously good. I met her at SpaceFest IV and we hit it off instantly – she’s smart, funny, and holy cow, what an amazing artist. When she posted that photo of her painting on Facebook, I immediately asked her if I could put it up here. Wow. And she picked a heckuva target to paint. 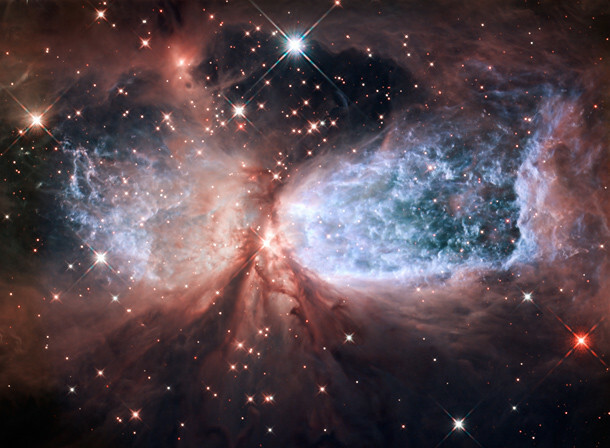 Sharpless 2-106 is a complex, gorgeous nebula, which I explained in detail in an earlier post. If you want – and you do – here’s a higher-res version of the Hubble shot, and Lucy has a somewhat bigger shot of her painting on her website. She also has a look at the process she did to make the painting , too, which is fascinating. Do yourself a favor, and do what I do: surround yourself with smart, talented friends. They make life far more interesting, and far more fun to live. – Come to SpaceFest IV!